Emoji, the icons that flavor our text conversations, are a serious business. People use them every single day and their widespread circulation means that virtually every person who has ever owned a smartphone, tablet, PC, laptop or any other device that you can use to communicate with other knows something about them. What most people do not know, however, is that emoji are governed by their very own organization. The Unicode Consortium is a nonprofit organization whose members include Apple, Google, Microsoft and most other major tech companies of the world. What the Consortium is mostly concerned with is the Unicode Standard, a system that has been set in place both to prevent the overgrowth of emoticons and, most importantly, to ensure that communications do not falter just because a company decided to add some strange emoji that can only be seen by a few people. In essence, tech companies have agreed to adhere to the Unicode Standard so that emoticons such as “:)” can be used by anyone. Individual companies are free to create their very own emoji characters, of course, which is why you get yellow smiley faces in one application and aliens with huge smiles in another. And that is precisely how the system is supposed to work, in theory. In practice, companies are not actually required to employ the latest emoticon standards right away which is what has brought us here today. Apple decided to support the new standard immediately with the release of iOS 9.1 whereas Google has not issued a similar update for Android devices. 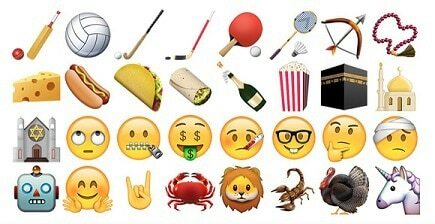 This means that iOS users are sending new emoji to their Android friends but they only appear as empty boxes or other strange characters. Google is already working on updating to the latest standard but until that happens, there is an alternative solution. If you do not want to wait for Google to issue its own update, you have to install the emoji manually. Developer DespairFacor created a flashable zip that contains all of them so technically the only thing you need to do is to flash it. Unfortunately, that is not as easy as it may sound. Flashing ZIP files requires a rooted Android device with a custom recovery (such as TWRP) or the Flashfire app. If you are familiar with these terms, you should find this post extremely easy to follow. Otherwise, I would suggest reading a bit about them to the point where you feel comfortable with their concepts. For the rest of you, the flashable ZIP can be found here. Before you continue, and this is very important, I strongly recommend that you perform a full backup of your device. The ZIP file can and will ruin emojis entirely in certain devices. You are installing everything at your own risk so you might as well have a backup in case something goes wrong. More information can also be found in our guide on performing Nandroid backups . It does not matter which recovery you are using though the steps are somewhat different. Load your phone in recovery mode. Find the ZIP file in your system and select it. Swipe the slider at the bottom of the screen to start the installation. Tap on Reboot System and you are done. Select the Install ZIP option. Choose where the file is located. Find and select the ZIP file and confirm the installation. Reboot your device to finish the process. Another method you can use is Flashfire. In case you have not heard, this is Chainfire’s latest app and you can grab it by becoming a tester. Once you actually have the app, all you have to do is tap on the floating button, select the “Flash ZIP or OTA” option, choose the ZIP file and then tap on the huge Flash button. Easy as cake, but the app is still in testing phase and a lot of devices are not yet supported so it might not be a viable option for you. Though you can ask your iOS friends to send you a message containing the new emojis, the easiest way to test whether their installation was successful or not is to head over to Emojipedia’s Unicode 8.0 page. If you can see the characters on that website then everything has gone according to plan and glitchy boxes will soon be nothing but a distant memory.